If you have an oven not heating, it’s virtually useless. Fortunately, you can hire a qualified oven repair technician to help you out, or you can try to fix it yourself. Use our troubleshooting guide below to determine why your oven isn’t heating properly. 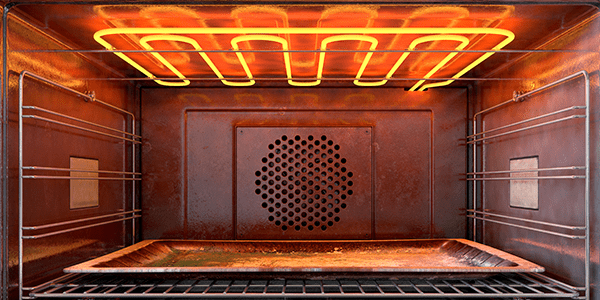 We cover the top 5 causes of this common oven problem, from broken igniters to defective gas burners. What it is: When your oven isn’t heating properly, check the igniter first, as it’s the most common part to fail. The igniter works by drawing electrical current through the oven safety valve to open it. Next, it heats up enough to glow and ignite the gas in the burner. How it fails: However, over time the igniter can weaken, causing it to fail when opening the safety valve. If this valve doesn’t open, the oven will not heat up. How to Diagnose it: You can check this by turning the oven on and seeing if the igniter glows for more than 90 seconds without igniting the gas. If this is the case, the igniter will need to be replaced. What it is: The bake element glows red hot in order to heat the oven to the desired temperature. How it fails: The bake element can burn out with use. Burn spots or blisters cause the heating element to fail. How to Diagnose it: Often, you can visibly see if the bake element is burned out. Look for charring or blistering on the element itself. If you see any physical damage, you can purchase a new bake element and replace it fairly easily. What it is: An oven thermal fuse is designed to trip if the oven gets too hot. This will cause the power to shut off for safety reasons. How it fails: At times, a thermal fuse can blow, leading to an oven not heating properly. While this is not the most common problem, it can happen. How to Diagnose it: You can use a multimeter to test the thermal fuse for continuity. If no continuity is found, the fuse will need to be replaced, as it cannot be reset. What it is: A spark electrode ignites the gas for bake and broil burner ignition. It is located next to the burner and, and as power is applied, a spark goes from the electrode tip to the shield, thus igniting the gas. How it fails: The bake or broil spark electrode can break or wear out over time. If this is the case, there will be no spark and in turn, no heat to your oven. How to Diagnose it: Look at the electrode and see if you can spot any cracks in the porcelain housing. There may be damage to the electrode tip itself. There also needs to be proper ground and correct polarity at the wall outlet. Replace or repair as necessary. What it is: The outlet that your oven is plugged into and the power cord itself are responsible for initiating all of your oven’s functions. How it fails: The outlet may not have sufficient voltage for your oven’s needs, or the power cord could have issues. How to Diagnose it: Use a multimeter to test your outlet for sufficient voltage. Also, check your power cord for frays or damage, and, as silly as it sounds, make sure it is plugged in. This is actually a quite common cause for an oven not heating. Have another oven problem you need solved? Take a look at other common oven problems we service.